This piece is co-authored by Sharon Moshavi and Fatima Bahja. Despite great strides, journalists around the world are not keeping pace with the transformations of the digital era. That is the conclusion of the first-ever global study on how news media are adopting new technologies, conducted by the International Center for Journalists (ICFJ). Against this background of immense challenges for the news industry, there is some good news: Digital news is making tremendous headway worldwide. The journalism community has long discussed how the digital revolution is impacting news media. Our study, The State of Technology in Global Newsrooms, focuses on a missing link in this debate: What technologies are journalists around the world using and how? We conducted the survey in 12 languages, and heard from more than 2,700 newsroom managers and journalists from 130 countries. This massive response identifies specific challenges the industry faces: a technology gap, unmet training needs, lack of audience engagement, concerns about building trust, an information security shortfall, and new revenue streams. The study also identifies the digital leaders and laggards. Most newsrooms, even digital-only ones, have not redefined jobs for the current era. In a sign of how removed journalism remains from technology, just 5% of newsroom staff have technology-related degrees. Only 2% of newsrooms employ technologists and 1% employ analytics editors. Just 18% of jobs are for digital-specific roles such as social media editor and digital content producer. There is near-universal agreement among journalists and newsroom managers that digital training is essential. 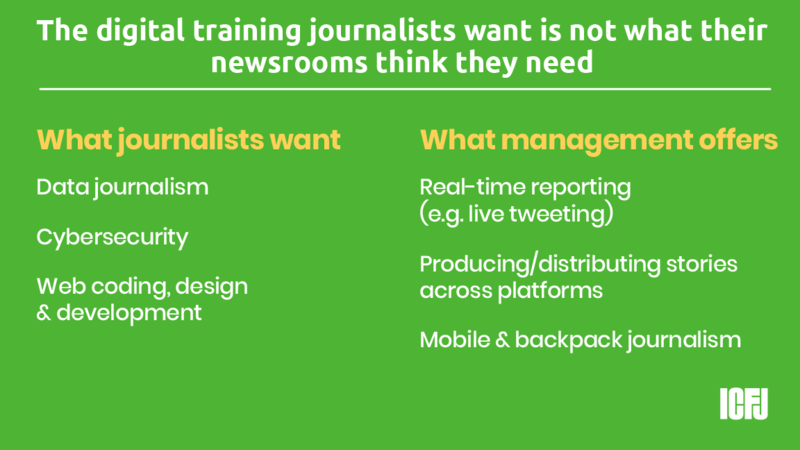 However, the study reveals a troubling disconnect between the training newsrooms are offering and the training journalists are looking for. Journalists are seeking skills that can boost their professional value and propel their careers. Meanwhile, newsroom managers are more interested in equipping their staff with the skills needed to better streamline newsroom workflow and increase production. For example, most journalists view data journalism and cybersecurity as important areas for training. But most managers report that their organizations offer training in producing and distributing stories across platforms and interdepartmental collaboration. The digital era has multiplied competition for audiences. While newsrooms have access to a wealth of metrics to help them understand and improve the way audiences interact with their content, few are actually using them. Gaining audience trust is a hot topic, as we all grapple with “fake news” and misinformation. Indeed, ICFJ’s study found that journalists in Europe, Latin America and the Middle East are very worried about losing audience trust. But we also found two outliers. 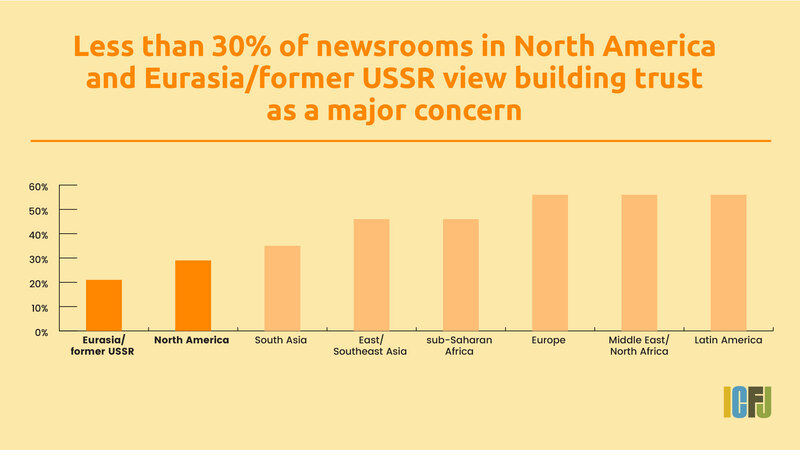 Only 21% of newsrooms in Eurasia/former USSR find building audience trust to be a major concern. North America follows closely, with 29% of newsrooms, also bucking the global trend. Despite the proliferation of cybersecurity tools, more than half of newsrooms (53%) and journalists (54%) take no measures to secure their communication. This is particularly alarming in the current media environment, where journalists are exposed to a wide array of threats that may risk their reputation or personal safety. Europe stands as a clear leader in this area, with 61% of newsrooms taking measures to secure their communications. North America is below the global average, with just over 40% of newsrooms taking digital security measures. Latin America ranks lowest with 38% percent. The most important revenue generator, after advertising, is sponsored content. 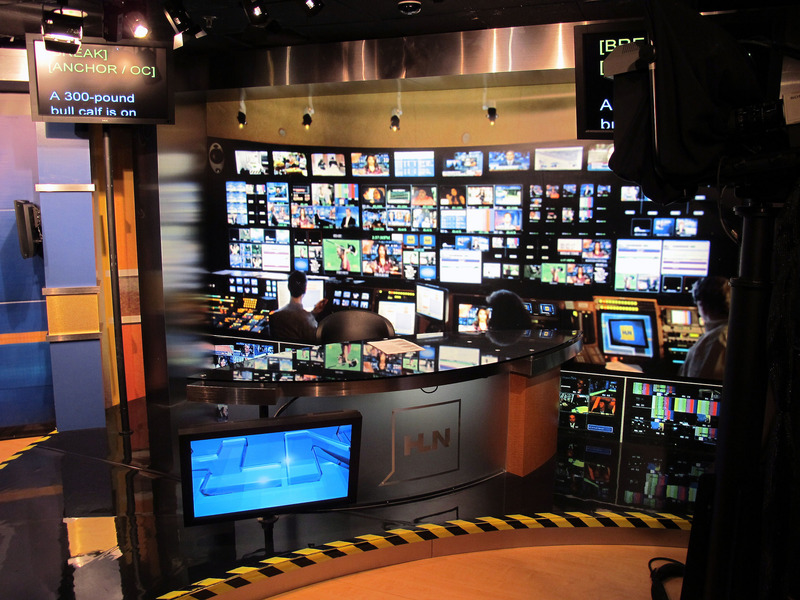 Forty-four percent of newsrooms report that they rely on it. Still, most outlets–particularly those in the developing world–report urgency in finding new sources of revenue. Over 70% of newsrooms in sub-Saharan Africa, Latin America, and Middle East/North Africa identify this as a major challenge compared with 44% of North American ones. Digital-only newsrooms are finding the greatest success in diversifying their revenue streams. They are twice as likely to generate revenue from alternative sources (philanthropic contributions and individual donations/crowdfunding, for example) as traditional or hybrid newsrooms (those that combine digital and traditional platforms). Against this background of immense challenges for the news industry, there is some good news: Digital news is making tremendous headway worldwide. 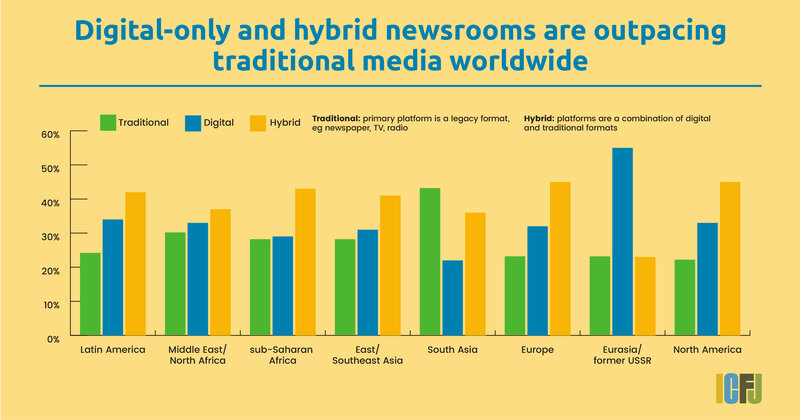 Traditional media have lost ground to digital-only and hybrid newsrooms. Surprisingly, the leader is Eurasia/former USSR, with the highest percentage (55%) of digital-only newsrooms. South Asia is the laggard. It is the only region where legacy media reign. 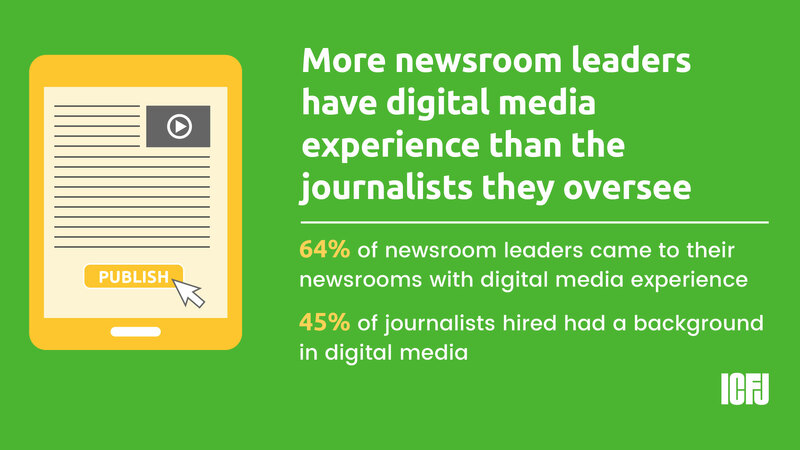 Traditional organizations account for 43% of the region’s news media industry, compared to 22% that are digital-only. 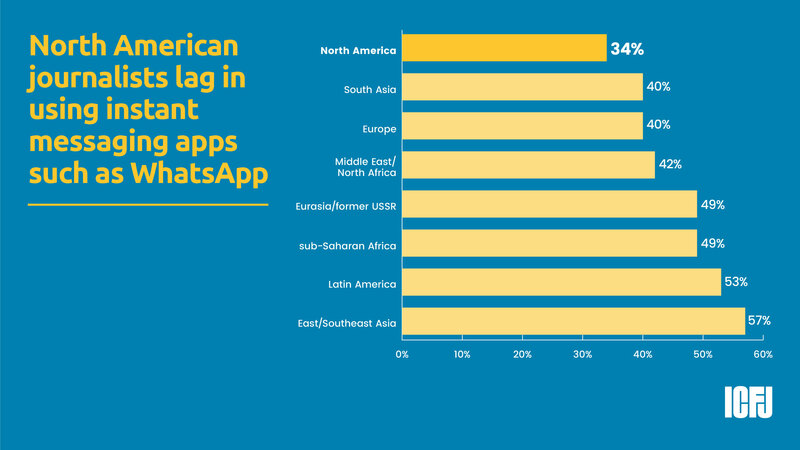 When it comes to using instant messaging apps like WhatsApp and WeChat, East/Southeast Asia — which includes China — is the leader. Nearly 60% of journalists in that region use instant messaging apps to gather information. The laggard: North America. Just one-third of journalists there use instant messaging apps. We plan to use the survey data to guide future projects in the US and around the world to advance quality journalism. And we are working with Google News Lab to develop a data visualizer that will allow everyone to dive even deeper into the study’s findings. Stay tuned. We urge you to explore the highlights on Medium and the full report. We welcome your feedback as well as ideas on how to fill the gaps the survey identifies. Storyful, Google News Lab and SurveyMonkey supported the study. Georgetown University’s Communication, Culture, and Technology program helped to administer and analyze the survey, which was distributed via SurveyMonkey. Results were collected across eight regions: Eurasia/former USSR, Europe, Latin America, Middle East/North Africa, North America, sub-Saharan Africa, South Asia, and East/Southeast Asia. Sharon Moshavi is Senior Vice President, New Initiatives, and Fatima Bahja is Manager, New Initiatives at ICFJ. Contact us at [email protected] or [email protected].